Gamebookers is a relatively old bookie. It’s quite hard to become one of the top online bookmakers without any marketing help. This is the reason Gamebookers is part of the Bwin group – namely, Party Digital Entertainment. The business was created in 1998, but the company goes live on the market in 2000. Aside from Gamebookers, the bookie is often called The Combi Kings due to their Combo Jackpot feature. Even the design of Gamebookers is similar to the other Party Digital Entertainment websites, so it’s very easy to discern them from their competitors. The online betting platform is licensed and operates under the jurisdiction of Gibraltar, a typical spot for bookie registrations. As for the design itself, it consists mainly of dark and light gray colors, combined with orange highlights. The overall vision doesn’t hurt the eyes, and the visual fidelity of the elements is high. Every element can be easily seen and found and betting on events is as easy as one two three. The Gamebookers website is in the 116000th place of most visited sites in the world. The interesting thing here is, that Gamebookers has risen to rank the last three months. People seem to love the service! The visitors come mainly from Romania, followed by India, UK, Slovenia, and Japan. Gamebookers is one of the pioneers of the online sports betting scene. In a sense, they are the innovators of the market, since they were the first to entwine traditional bookmarking and betting exchange. 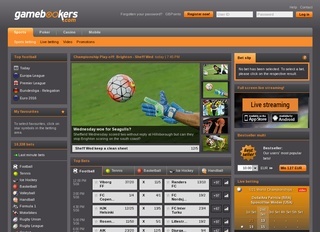 Gamebookers are prepared to meet most players’ needs in terms of betting markets. The bookie offers over 15 different sports, including the traditional football and tennis and the less famous handball and beach volleyball. The website also hosts some live betting options for those who like to live in the moment. The live options consist of football and tennis events, completed with a calendar and a video section. Sadly, no live streaming is available, but this should not hold you back. Very few online bookmakers offer live streaming on their sites. As you know, the sportsbook is rarely the only playground for bettors. People love casino games, and this is why Gamebookers has an excellent casino section. Granted, it is not the best out there, but the games are many, and the quality is exceptional. Most of the best-sellers are available on the Gamebookers website, so if you are into casino games, you should give them a try there. You will not be disappointed, especially with all the promotions the bookie offers to the players! Not many betting websites offer poker tables, but Gamebookers does. The bookmaker handles poker in a particular way, focusing on tournaments. Of course, you can play poker on standard tables, but with all the tournaments happening almost continuously, players are more likely to test their mettle in a big free for all. Gamebookers are nice enough to offer their customers a great poker school, containing tips to become a better player and covering the basics for newcomers. With the odds offers from Gamebookers, you are guaranteed satisfaction. Seriously, though, for most of the matches you have more than a hundred betting options! You can bet on all the standard modes – 3-way result, halftime, full-time and teams to score. Some of the other options are handicaps, multiple correct score and goals in 1st half. The payouts are very competitive, with the maximum going up to 251 to one. The SSL encryption on Gamebookers is provided by Thawte and is as secure as it can be. The bookie is also a member of some fair gaming organizations – EGBA, ESSA, and eCOGRA. You can be sure your personal data and transfers will be safe, and your gaming experience will be fraud-free and uninterrupted by bad experiences. The customer service of Gamebookers is excellent and prompt. The only problem is that you cannot contact the representatives through live chat. Otherwise, you can get your questions answered by email and phone. Depositing money into your Gamebookers account is relatively straightforward. You can use all the major credit cards, plus some e-wallet providers like Neteller and Skrill. Withdrawing is done using the same means. The accepted currencies can be seen in the table. The website payout rate is excellent. The minimum bet is $0.1, and the maximum varies between sports. Your winnings are limited to 175000 EUR per week. The bookie is great both for recreational and professional betting enthusiasts. All the currencies accepted at the moment can also be seen in the table aside. Of course, Gamebookers offers an excellent affiliate program. It’s the Bwin.Party program, so if you’ve used Bwin before, you most probably know about it. The online bookmaker also offers a loyalty program, where you gain points and exchange them for gifts. Aside from the programs, Gamebookers gives away lots of free money in both the casino and poker sections. The bookie hopes to elevate user experience even more using the bonus offers and, if I might say, it works so far. The popularity of the website is rising, and the clients are happy.